FA Vase second round at the Aspray Arena (kick off 3pm). The opponents: Hucknall Town, straight outta Nottinghamshire of the Central Midlands Football League – Division South. Seven league games this season, 19 points with six wins and a draw and – get this – a whopping 40 goals, almost six goals a game on average. Their last three league games were against Mickleover RBL (6-2), Hilton Harriers (7-1) and Welbeck Lions (8-0). So, the boys can play. 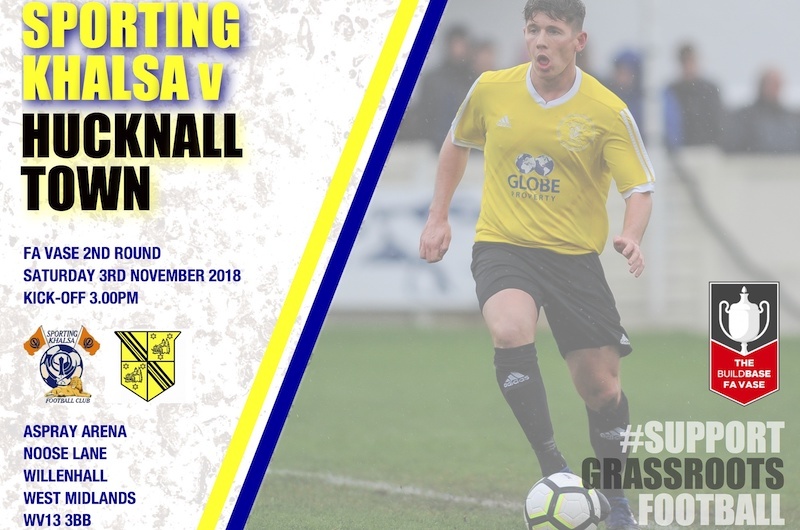 In the last round of the Vase, Hucknall pulled off a great win over Khalsa’s neighbours Black Country Rangers, beating them 3-2 with ten men and a last minute penalty. Us? Well, after losing 4-0 to Westfields to end a nine-match winning run we’ve stabilised, grabbing important results at Worcester City (1-0) and Lye Town (0-0).